Sunburst Chemicals is a manufacturer and supplier of the finest quality commercial cleaning products and sanitation detergents, partnering with distributors to serve customers nationally. They needed a design that reflected their market and customers. Sunburst Chemicals is a manufacturer of cleaning agents and sanitation detergents for commercial applications. They were looking to revamp their website on our amazing responsive WordPress platform. After speaking with their team, we understood that they had a very particular style in mind, to match the branding of their print catalog and other materials. We took their catalog as a base, and designed the site from there. Useing beautiful images and lush greens to emphasize the natural design they used, we really think we made the site unique, while still keeping it within the current design trends. We also created a custom quick order form, allowing users to login to the site, and place an order using a form that contains their frequently ordered products. We also created a “Quick Quote” form, which Sunburst uses to generate leads. The client requested that actual purchases not be handled through the site, so we disabled the purchasing functionality while still building a fully responsive, feature heavy WooCommerce platform. 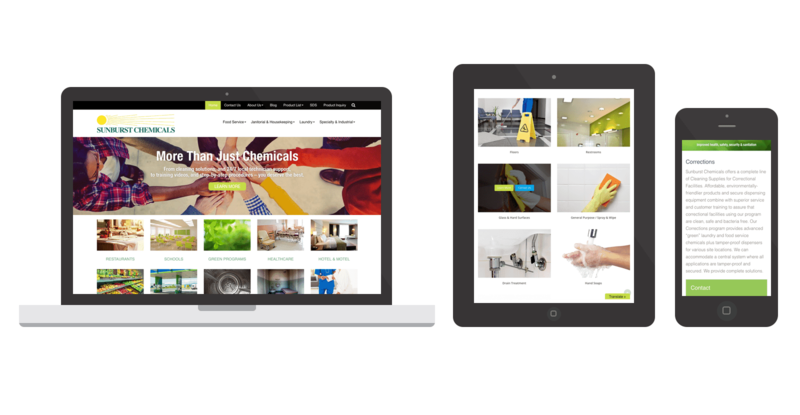 All in all we’re very proud of the responsive, e-commerce site we built for Sunburst Chemicals. Another great build from Spark Logix Studios!